Aetolia-Acarnania (Greek: Αιτωλοακαρνανία, Aitoloakarnanía, Greek pronunciation: [etolo.akarnaˈɲi.a]) is one of the regional units of Greece. 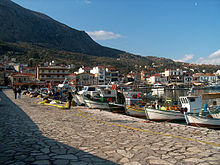 It is part of the geographic region of Central Greece and the administrative region of West Greece. A combination of the historical regions of Aetolia and Acarnania, it is the country's largest regional unit. 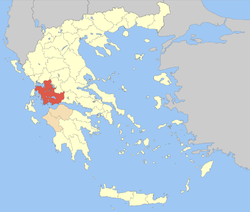 Its capital is Missolonghi for historical reasons, with its biggest city and economic centre at Agrinio. The area is now connected with the Peloponnese peninsula via the Rio-Antirio Bridge. The surrounding regional units take in Arta in Epirus, a narrow length bordering Karditsa of Thessaly, Evrytania to the northeast, and Phocis to the east. Mountains dominate the north, northeast, west and southeast, especially the Acarnanian Mountains. 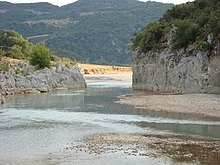 The longest and main river is the Acheloos, which ends as a delta in wetlands to the southwest on a rich fertile valley. The second longest is Evinos; others include the Ermitsa, the Inachos, and the Mornos (on the border with Phocis). The regional unit excludes the islands lying to its west, since they belong to the Kefalonia and Ithaca regional units. There is one reservoir and a lake in its central part. The many mountains of the area span the Panaitoliko toward the northeast and the Acarnanian Mountains, the Valtou and the Makrynoros mountains in the north, the Nafpaktia Mountains in the southeast, the Arakynthos and Kravara in the south. 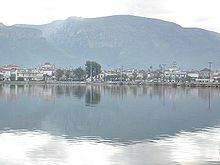 Lakes include the Amvrakia, the Lysimachia, Ozeros, and Trichonida, and artificial lakes and reservoirs include Kastraki, Kremasta, the largest lake in Greece since its creation in 1970, and Stratos. 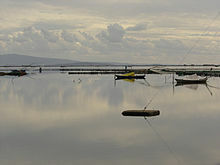 Two lagoons are found in the southern part of the regional unit: the Messolongi and the Aitoliko.The lowest altitude in Greece is found in west Aetolia-Acarnania at about -10 meters from the sea level. Its climate ranges from hot and humid summers, with temperatures often surpassing 40°C, to mild and short winters in the low-lying areas, with cool winters dominating in the mountain areas. At the highest elevations, summers are cool, and snow and cold weather dominate the winter months in the Panaitoliko. 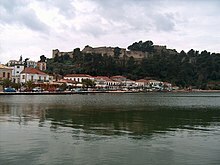 During the Ottoman period, between the 16th century until the Greek War of Independence, the region was called Karleli and formed a province (sanjak) in the Rumelia Eyalet. The following years, GR-5 bypassed Messolonghi and Agrinion and GR-38 became connected with paved road with Eurytania and Phthiotida. In the late-1980s, the by-pass of Naupaktos began construction but after paving the road, the signs did not appear and until 1998, it was left unopened. In 1999, the road was re-repaired and finally opened to traffic. In 2000, the construction of the Rio-Antirio or the Charilaos Trikoupis Bridge connecting the Peloponnese began construction and was opened to traffic in August 2004. The superhighway, the Ionia Odos (Ionian Motorway) which will run centrally bypassing communities began construction in 2001 at a part between Messolonghi and the curve, this section remains to be unpaved, the rest of the highway is in plan but the opening date is not yet set. A railway formally served the places from Kryoneri and Agrinio and served with the ferry with Rio. In the 1980s, the service came to an end. As a part of the 2011 Kallikratis government reform, the regional unit Aetolia-Acarnania was created out of the former prefecture Aetolia-Acarnania (Greek: Νομός Αιτωλοακαρνανίας). The prefecture had the same territory as the present regional unit. At the same time, the municipalities were reorganised, according to the table below. Wikivoyage has a travel guide for Aetolia-Acarnania. Wikimedia Commons has media related to Aetolia-Acarnania.